This space has been created to provide an overview of the Collaborative Situated Active Mobile (CSAM) learning design framework, and the work that I am doing with CSAM (including my doctoral dissertation research in the Doctor of Education in Distance Education program with the Center for Distance Education at Athabasca University, Canada). CSAM stands for Collaborative Situated Active Mobile learning design strategies. 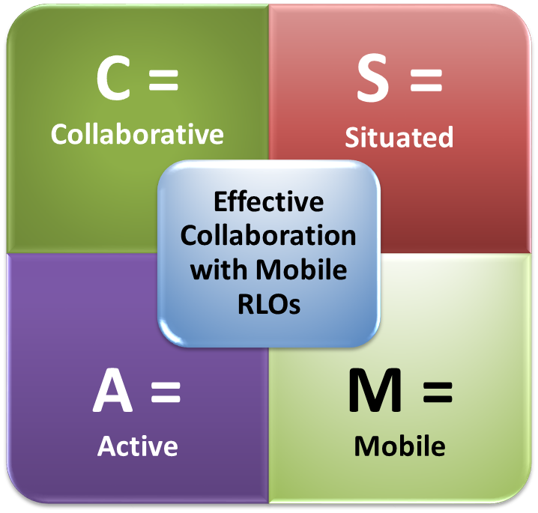 CSAM is a distillation of the key pedagogical elements guiding the instructional designs of case studies of the use of mobile RLOs to facilitate collaborative learner interaction. 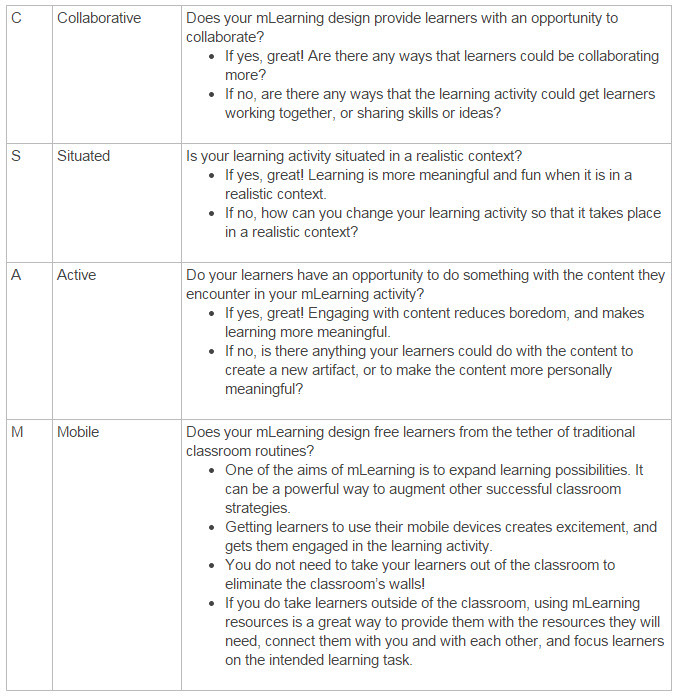 Download the template below (.xlsx format) to access a tool that can be used to guide critical reflection on the pedagogical design of mobile learning resources. The aim of CSAM is to provide a foundation for, and reflective practice when making decisions about when and how to use mobile RLOs to facilitate or enhance collaborative learning. Rather than focusing on mobile technology, CSAM places the focus on pedagogical decision making. CSAM learning design is represented in approximately one fifth of all chapters and articles analyzed in a meta-analysis of mobile learning publications between 2009-2014. The CSAM pedagogical components were represented in 86% of the chapters and articles that were about mobile RLOs, or that included mobile RLOs as supporting examples. Of the mobile RLOs that were described as supporting collaborative learning, 96% integrated all four CSAM pedagogical elements. You can learn more about the theoretical underpinnings of CSAM by reading my paper in Learning and Teaching in Higher Education: Gulf Perspectives, or from my poster on CSAM presented at the Mobile Learning: Gulf Perspectives Symposium in Abu Dhabi, United Arab Emirates, in April 2013. The works and resources posted to this site are licensed under a Creative Commons Attribution-ShareAlike 4.0 International License.